Our faith based program incorporated mentoring with ranching work to help struggling teens learn through trust, hard work, and personal growth. We believe that our family ranch is a place where individuals can inherit the timeless values that challenge and shape daily lives. 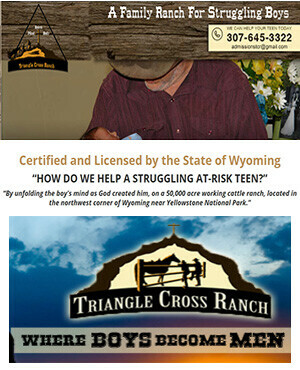 At Triangle Cross Boy’s Ranch, we are proud of our western heritage, and seek to pass on this great American tradition by offering boys the chance to become true cattlemen by working with livestock owners. This program is genuine hard work both emotionally and mentally. But by simplifying his needs, and understanding his responsibilities, his faith and his friendships can grow at Triangle Cross Ranch. Our process incorporates faith based teaching with our mentoring programs to create an approach that is associated with healthy child development. We’ve found that our trained mentors are able to understand the individual pains of each boy in our program, while simultaneously enforcing a strict discipline. Each child has a unique character, because of this, each mentor has individualized expectations of each child based on this. Our mentors develop a rich and paternal relationship with the boys that helps them develop trust and ultimately be more acceptive to discuss their emotional conflicts and the challenges they face as youth in the 21st century. The essential qualities of a menor in our program is his character, not his certified knowledge on adolescent psychology. Our mentors are approachable and relatable. An effective mentor’s character must not only be of an unquestionable character, but he also must be transparent. By this we mean that each mentor much be open with our boys as they are with them. Trust is a two-way street, and this humble and warm approach helps enable our instructors to lead, and the teens to heal. We make sure that the time we have together is as inspirational as it is effective. The start in every boy’s journey is to gain a deep knowledge of each boy’s personality and to perceive the individual dignity and essence of that character with a spiritual love and insight. Out program for troubled teens involves daily mentoring. There time with us involved living, working, praying, and overcoming obstacles together. Through our programs, the relationships developed with our mentors help create boys who are more receptive to discipline and behavioral modification through trust and mutual respect. By “riding the brand”, your son will gradually heal and begin to understand the importance of practicing an obedience to God in all his relationships. We believe that our program will teach him this invaluable lesson, helping him to accept the expectations his parents have for him as a son, siblings have for him as a brother, and his community has for him as a member. If you’re a parent or a guardian to a youth aged 12 to 18 whose behavior is self-destructive or disruptive contact Triangle Cross Ranch to get information on how we can help your troubled teen today. Asking for help is not a sign of weakness, but that of strength. Please call us at (307) 213-7116.